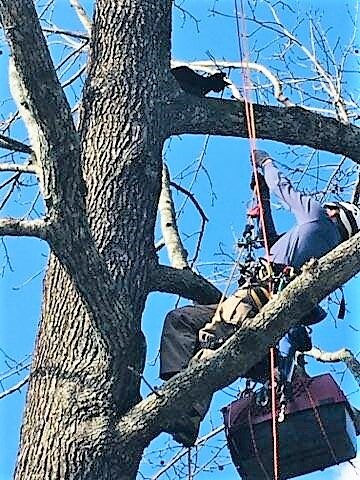 I was out running errands around town when Dan called me to see if I could rescue his cat, Ray, who was stuck in a sweet gum tree that was just beyond the fence in his backyard neighbor's yard. Dan had already obtained permission from the neighbor for me to go into their yard to rescue the cat. In fact, it was from them that Dan learned about me and got my phone number. Ray had been in the tree only three hours up to that point, but I could sense the urgency in Dan's voice. Dan knew his little 1-year-old boy was stuck, and he was not going to waste any time in helping him. I cut some items from my errand list so that I could get there sooner, and we agreed on a meeting time three hours later. once in a live oak tree in that same corner of the yard. At both rescues, Shirley and Wells were very gracious and delightful, and they welcomed me in their yard to rescue their neighbor's cat. 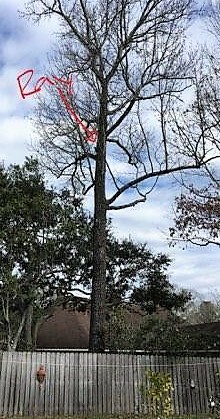 Now, Ray, who lives at the house behind them, is stuck in the same sweet gum tree, and again they graciously welcomed me into their yard. This would be the third rescue in their backyard for two unrelated cats, neither of which was their own. They do have a cat of their own which is always inside, but they also have a dog which may explain why the cats are in the tree. Since the yard is surrounded by a six-foot wood fence, the cats have nowhere else to go but up once they get in that corner of the yard. Ray was just over 30 feet high and crying to us below. 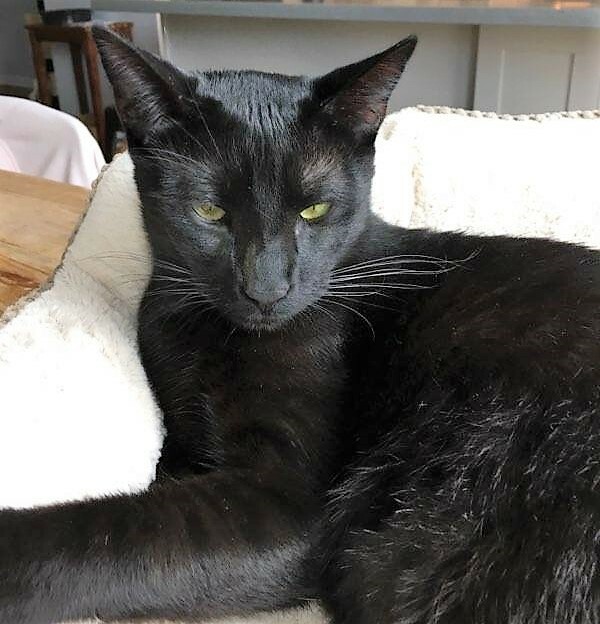 Dan described him as a very friendly boy, so I was expecting an easy rescue. I was not disappointed. Ray was happy to see me and eagerly greeted me and let me pet him. He rubbed his head in my hand and was perfectly relaxed. He looked down at my lap and appeared to want to step there, so I gave him the chance and encouragement. He stepped down onto my lap and was happy to get some more attention there. This was a sweet boy, and it was easy to see why Dan decided to select him for adoption when he found him at the Animal Control office months ago. 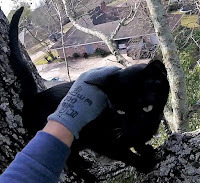 The route down to the ground was straight and unobstructed, and I verified with Dan below that Ray would know how to get home if he jumped off my lap close to the ground. Ray was still very relaxed, so I let Ray stay there in my lap while I slowly descended. Ray watched Dan and the ground below as we went down, and he was perfectly content. 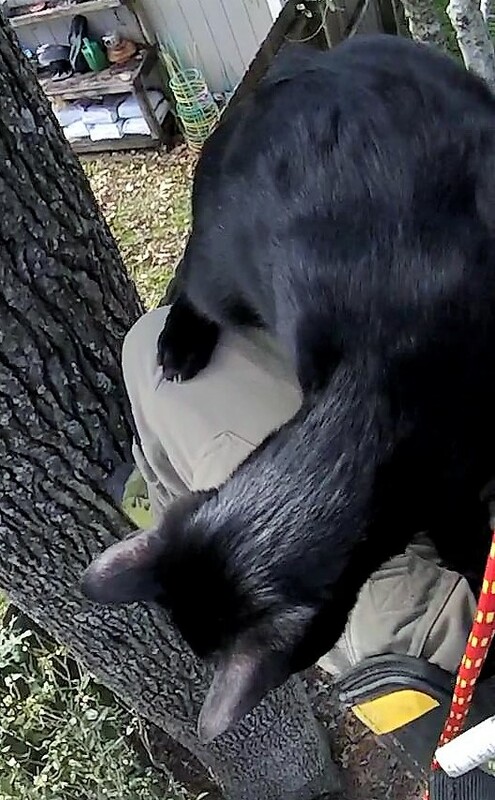 Normally, once I get close to the ground, a cat in my lap will jump to the ground and head home. Not Ray. Ray was comfortable there, so even though we were now on the ground, he stayed in my lap. After a few seconds in my lap, however, he jumped down and walked to the corner of the yard to find a route home. There were no holes in the fence, so I walked over there and picked him up to hand him to Dan over the fence. 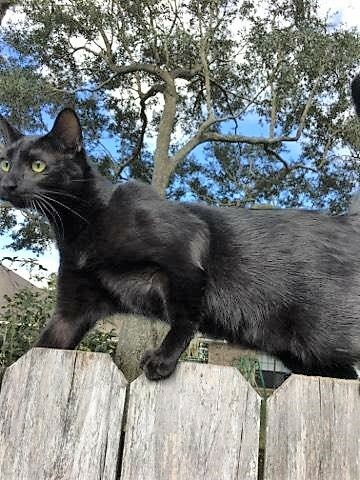 Ray decided to take matters into his own paws, however, and climbed up on my shoulder and jumped to the top of the fence himself. Dan reached up, lifted him off the fence and took him home. Sweet cat, easy tree, lap rescue, gracious people: those are rescues I enjoy the most. I forgot to take a picture of the tree, so thanks go to Dan for providing me his picture as well as the picture of me climbing up to Ray and the ones here of Ray on the top of the fence and resting afterward.